Writing a research paper is a great way to hone your skills in composition. It’s also a good opportunity to become acquainted with scholarly data. There are a lot of opinions about the proper way to proceed when it comes to doing research and writing the actual paper. Some say to do the investigation first, take copious notes, lay them out, brainstorm about how to put them all together, and then start writing. We say there’s a better way. In this article, we’ll lay out an easy-to-follow 10-Step Guide for crafting a great research paper in a short amount of time. First, let’s look at what a research paper is. A research paper is a formal document that sets out a thesis, establishes a consensus opinion based on available literature, tests a theory, argues a point of view, or highlights issues within a particular field. In short, it is an essay that centers on a single idea supported by evidence obtained through reading primary and secondary sources. Step 1: Pick a subject you’re interested in. (It can be anything!) If you’re not sure whether there is sufficient scholarly information on the topic you’ve chosen, try using Google Scholar. It is a good tool for doing searches for academic material. Step 2: Sure, you could read every scholarly article published on your subject. But a quicker way to obtain a sense of what the pros are saying is to read the abstracts and click on the links to related articles. When going through online databases of academic journals, use the abstracts to assess whether the article will help you achieve your objective! Step 3: Don’t wait to start writing. If it’s a subject you already know something about, you should have a good idea of what direction to go in. Begin your paper with a thesis statement and start building it out as you do your research. Helpful Hint: A thesis is simply a statement of purpose—i.e., what you intend to show in your paper. Every research paper should have one. Step 4: Do the majority of your research online. You can bring up multiple tabs in your browser—even for books and scholarly journals. This is the equivalent of spreading out a bunch of print material all over your desk. Step 5: Once you’ve used a source, reference it immediately in your “Works Cited” or “References” page. Step 6: Close out tabs that you have already taken source material from—just be sure you’ve referenced it (with a link if needed), as stated in Step 5. Step 7: Maintain focus: make sure your paper is following the thesis you’ve stated at the outset. Keep returning to it so that your paper flows well. Step 8: Whether you are doing qualitative or quantitative research, choose a methodology that is easy and works for you. Step 9: Not all research papers have the same requirements. Follow the rubric given you by your professor. Double check it! This can make all the difference between an “A” paper and a “D” paper. Helpful Hint: Keep your rubric open in a separate file so that you can always have it there. Check it after every 500-1000 words you write to make sure you are still on the right track. Step 10: Adhere to the word limit set within the professor’s parameters. Be concise when you have to be and be detailed when it’s allowed. If you’re not at your limit after the first draft, give it a read and fill in spots where gaps are most evident. If you’re over, trim out the unnecessary fat. Now let’s get into a few details. One of the biggest hurdles is simply getting started. Writers get scared of the specter of work that writing a research paper raises. Ignore that specter! Focus first and foremost on identifying the subject you want to research. Whether it is the causes of WWI or WWII, the evolution of the Frankfurt School, or how unconventional monetary policy has altered the global marketplace, choose a topic that you are comfortable with. If you don’t get to choose, don’t worry! There’s an easy way to start your paper without having to know a lot about the subject. In fact, if your professor is choosing the topic for you, you are likely to be given a prompt—a direction in which you should take your paper. (If you’re not given one, ask for one!) Knowing the direction to go in is crucial. It gives you an idea of what to research and what to write. You have to argue that one side was better than the other but don’t know where to start. You should have at least a little knowledge on the subject—enough to know that the Federalists supported ratification of the Constitution while the Anti-Federalists didn’t. You should know that the Anti-Federalists wanted each state to essentially be its own boss instead of having a centralized authority to which all the states were subject. With that in mind and with your own sense of how the American experiment has gone in the intervening 200+ years, you should be able to identify a position that you can argue and support with evidence obtained through research. So let’s look at an introduction and how it could be written for your research paper. For this type of paper, start off by introducing the topic. Then provide the reader with the position that you will be arguing. State why you are taking that position and how you will support it. Show what evidence there is for that position. Tell the reader how the paper will proceed and clearly identify the points that best support the position you have adopted. In the 18th century, America was still coming to define itself politically and structurally. It consisted of states, each with their own identities, groups and perspectives. It also shared a sense of unity, with the states recognizing a need to at least work together to ensure that the whole of the nation was not torn asunder by differences of opinion. However, two political factions developed—the Federalists and the Anti-Federalists. The Federalists sought to establish a strong central government to ensure that the states did not war with one another or entangle the entire nation in foreign wars. The Anti-Federalists supported localized power, de-centralization, and states’ autonomy within a loosely organized federation. Ultimately, the question came down to liberty versus security. Alexander Hamilton and the Federalists argued that, for the security of the nation, the Constitution must be ratified and the central/federal government recognized by the states. The Anti-Federalists argued against this idea, indicating that recognizing a central government over and above state sovereignty would take power away from the states and the local authorities and lead directly to a situation in which tyranny would be the end result. Looking back over the past 200+ years, it is easy to see that the Anti-Federalists were correct in their position. This paper will use primary documents and historical records to show why the Anti-Federalist position in 1788 was the more sensible of the two. Helpful Hint: Place the thesis statement at the end of the introductory paragraph (it is underlined here for emphasis—but you should not underline it in your research paper unless you are explicitly instructed to do so). Points to consider, which you can see in the example introduction above: the topic is introduced by providing context (an historical timeframe is given), the who and the what are clearly stated, and the main issue is identified. The position of the paper follows the background information and the authority upon which the paper rests its argument is briefly noted (primary sources). If you can, it is even better to state explicitly which sources you will use. Finally, the introduction concludes with the research paper’s thesis statement, which is the most important part of the introduction—so don’t forget it! It acts as the road sign for where your paper is supposed to go. Use it wisely! Now let’s say you need to write the paper using one of two citation methods—APA and MLA. Both are easy to use, and here are a few examples of how to do in-text citations and references at the end of the paper. 1. Hamilton (1787) stated in Federalist No. 6 that the federal government would be used to help save the individual states from suffering “factions and convulsions” (p. 26). 2. Federalists argued that the “factions and convulsions” of states fighting among themselves would be safeguarded by through the oversight and regulation of the central government (Hamilton, 1787, p. 26). From these two examples, it is clear that when the author is stated in the text, the date of publication follows the author’s name in parentheses with the page number of the quote coming after the quote at the end of the sentence. If the author is not named in the sentence, the author’s name and publication date of source material is included in the same parentheses as the page number. What if no quote is used? Easy. 1. Federalist No. 6 argued for a strong central government because of a fear that the states would fight among themselves and cause the unity of the nation to collapse (Hamilton, 1787). When the source material is paraphrased, all that is needed is the author’s name and publication date. Storing, H. (1981). What the anti-federalists were for: The political thought of the opponents of the Constitution. Chicago, IL: University of Chicago Press. Helpful Hint: Titles of books and/or articles should only have the first word capitalized. If there is a colon used in the title, you may also capitalize the first word following the colon. Titles of books, websites and academic journals are placed in italics. If using MLA as your citation method, the style is a little different for both in-text citations and references at the end of the page. In MLA, the author’s name and the page number of the text from which the quote is taken are placed in parentheses. If no direct quote is used, only the author’s last name is needed. If the author’s name is used in the sentence itself, there is no need to place it in parentheses at the end of the sentence. 1. As Storing notes, the Anti-Federalists supported “federalism in opposition to what they called the consolidating tendency and intention of the Constitution” (10). 2. The Anti-Federalists argued against the “consolidating tendency and intention of the Constitution” (Storing 10). 3. According to Storing, the Anti-Federalists were not opposed to federalism but rather to the Constitution, which they viewed as a threat to state sovereignty. Storing, Herbert. What the Anti-Federalists Were For: The Political Thought of the Opponents of the Constitution. Chicago, IL: University of Chicago Press, 1981. Print. Notice that the title is completely capitalized—unlike in APA. For more information on how to cite works in either MLA or APA style, go to Purdue OWL, an excellent source of information. When going from one paragraph to the next, it is important to maintain good flow within the paper. One way to achieve that flow is to use transition words to help you move from one thought to the next. A transition word or phrase is something writers use to shift the direction of the thought processes. If your first body paragraph, for instance, is about how Hamilton wanted a strong federal government, you could use the transition phrase “On the other hand” to introduce opposite viewpoint of Jefferson, a supporter of anti-federalist sentiment. Try this BYU site for many examples of transition words and phrases and how to use them. Title pages can be tricky for writers. Again, it all depends upon the citation style being used for the paper. APA style will have a title page standalone and a running header on each page. MLA will typically have the title on the same page as the essay itself, with class information in the upper left hand corner of the paper. For research paper topics, try out this awesome list. 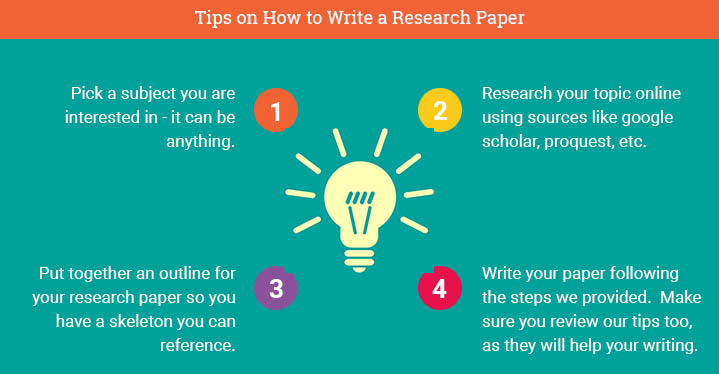 If you need more help on how to write a research paper outline, check out this article. Look at an excellent research paper example to get see a completed version. Writing a research paper doesn’t have to be a chore. It can actually be a lot of fun! The trick to having fun with a research paper is to choose a topic that you would like to know more about. Almost everything under the sun has been written on by academics—whether it’s pop music, social justice, economic theory, outer space, history, or fashion. So don’t worry that you won’t be able to find enough information to constitute a research paper. However, if you don’t get to choose your topic, don’t worry! Use the Internet to help look up good info! Another key to writing a great research paper is to have an effective thesis. The thesis is needed to steer the paper: it tells you and the reader what it will be about. If your paper will argue a point or perspective, say so in the thesis statement. Also, if you are examining a certain hypothesis or writing a more in-depth paper with a methodology, literature review, and discussion on findings, you’ll most likely want to separate your paper out into chapters with headings. That’s a much longer work and will typically require a lot more research. Don’t wait to start writing. As soon as you settle on a topic, start putting down your thoughts. You can arrange it more effectively later on. The important thing is to get going! Conduct searches online and keep sources open in tabs on your browser. This is just as good as going to the library and spreading out a bunch of books across your desktop. Remember to always cite your sources both in your text and at the end of the paper. Use a single citation method and be consistent. Pay attention to the rubrics given you by your professor. Don’t go over or under the word limit and adhere to the parameters provided. The research paper is your chance to show what you know about a particular subject, so don’t hesitate to explain items at length. Get into the nitty-gritty! Give lots of details to support your main point, whatever it is, but be sure to keep a good flow throughout. Don’t jump from one random idea to the next. Use strong transitions to help move the reader along. 1. Use the Internet to research your subject. 2. Don’t wait until you’ve finished researching to start writing! As you write, you will find that you need to look up more info, so view writing and researching as one, seamless process. 3. Always reference your source material. 4. Adhere to whatever rubrics you are given. "How to Write a Research Paper." Aceyourpaper.com. Student Network Resources Inc, 15 August. 2017. Web. 19 April 2019. Student Network Resources Inc. "How to Write a Research Paper." Aceyourpaper.com. 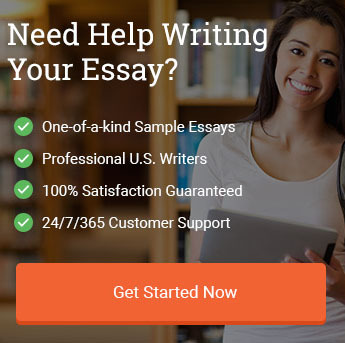 https://www.aceyourpaper.com/essay-writing/research-paper/ (accessed April 19, 2019).